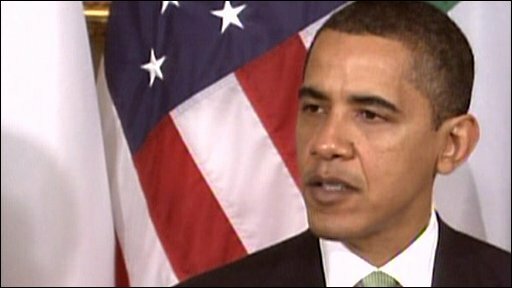 US President Barack Obama has said the people of Northern Ireland responded "heroically" to recent murders. The dissident republican murders of two soldiers and a policeman sparked widespread public outrage. President Obama said after watching former adversaries uniting in the face of what happened, he had never been so confident that peace would prevail. He was speaking at a St Patrick's Day ceremony in the White House after meeting Taoiseach Brian Cowen. "I want everyone listening to know this - the United States will always stand with those who work towards peace," he said. The murders earlier this month by dissident republicans of a police officer and two soldiers in the space of three days has placed renewed international focus on Northern Ireland. President Obama said the "real question" was how the people of Northern Ireland would respond following the killings. "Now we know the answer - they responded heroically. They and their leaders on both sides have condemned this violence and refrained from the old partisan impulses," he said. "They've shown they judge progress by what you build and not what you tear down. And they know that the future is too important to cede to those who are mired in the past." 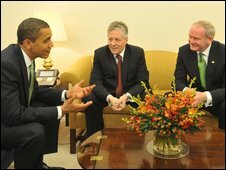 President Obama also met Northern Ireland's first and deputy first ministers Peter Robinson and Martin McGuinness in the office of his national security adviser. Mr Robinson said he believed both he and the deputy first minister had reassured Americans about the prospects for investment following the recent dissident republican murders. He said that several US businesses were looking to relocate to Northern Ireland. Mr McGuinness said "the dissidents' strategy would never unite Ireland in a million years". The DUP and Sinn Fein MPs who lead Northern Ireland's devolved government had twice delayed their departure for the US because of the killings. 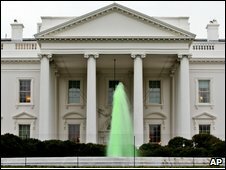 St Patrick's Day visits to the US by politicians from Belfast and Dublin have become a tradition, and the White House marked the occasion by putting green dye in the fountains. The idea came from First Lady Michelle Obama, who was inspired by her hometown of Chicago's custom of dyeing the river green for the day. After his meeting with Mr Cowen, President Obama said he hoped to visit Offaly, the Irish county from which his ancestor Falmouth Kearney emigrated to America. He joked to Mr Cowen: "We may be cousins. We haven't sorted that through yet."